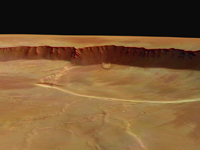 This vertical view shows the complex caldera (volcanic summit crater) of Olympus Mons on Mars, the highest volcano in our Solar System with an average elevation of 22 km. The caldera has a depth of about 3 km. 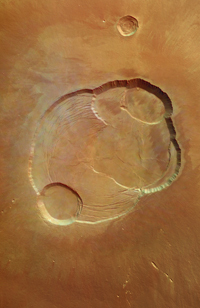 This is the first high resolution color image of the complete caldera of Olympus Mons. The color image was taken from a height of 273 km in orbit 37 by the High Resolution Stereo Camera (HRSC) on Mars Express on 21 January 2004. The view is centered at 18.3°N and 227°E. The image is about 102 km across with a resolution of 12 m per pixel. South is up. This perspective view shows the southern part of the caldera (volcanic summit crater) of Olympus Mons on Mars. The image has been calculated from the digital elevation model derived from the stereo channels and combined with the nadir- and color channels of the High Resolution Stereo Camera (HRSC) on Mars Express. The scene reveals tongue-shaped mass-movement features in 3D on the southern wall. The data has been retrieved from a height of 273 km in orbit 37 on 21 January 2004. The view is centered at 18.3°N and 227°E. The image is about 40 km across. The vertical exaggeration is 1.8. South is up. This perspective view shows the complex caldera (volcanic summit crater) of Olympus Mons on Mars. The image has been calculated from the digital elevation model derived from the stereo channels and combined with the nadir- and color channels of the High Resolution Stereo Camera (HRSC) on Mars Express. The data has been retrieved from a height of 273 km in orbit 37 on 21 January 2004. The view is centered at 18.3°N and 227°E. The image is 102 km across and has a resolution of 12 m per pixel. The vertical exaggeration is 1.8. South is up.